First let me clear something up. Every year when the Oscars roll around some people in my jewelry circles have a fantasy that stars from the golden era of Hollywood were magnificently bejeweled in their own pieces at the event. I hate to rain on anyone’s parade, but I must report, for the most part, they weren’t. Trust me, I have done the leg work. Oh, sure there might be a couple of examples of nice pieces here and there, but on the whole, the jewels in the old Hollywood days were not on a scale of the (admittedly borrowed, but still) masterpieces we see on the red carpet today. Far from it. The one mega exception to this rule is, of course, Elizabeth Taylor. From the time she was a child star, Taylor attended the Oscars. She was nominated for five Best Actress prizes and won twice for her roles in Butterfield 8 (1960) and Who’s Afraid of Virginia Wolf? (1966). 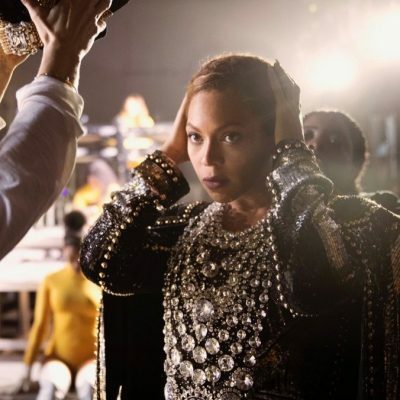 Over the years, she sparkled in several sensational jewels from her own collection at the ceremony. In 1957 she put on the antique diamond tiara she received from Mike Todd. Her Van Cleef & Arpels 32.14-carat cognac diamond ring and earrings from Richard Burton were her accessories for the 1974 Oscars. At the 1970 ceremony, the world got a long look at the 69.42-carat pear shape Taylor-Burton diamond that made headlines around the world when Richard Burton purchased it for just over one-million from Cartier. At the time, it was the most expensive diamond in the world. 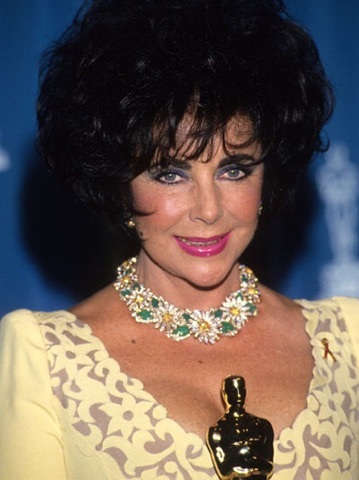 There are several other examples of great treasures Elizabeth Taylor wore at the Oscars and with her passion for jewelry I am certain she deeply loved each and every one of them. 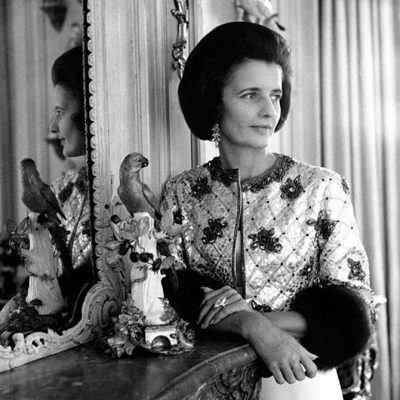 Yet, I feel if she were here today, she might just say the AIDS Awareness Red Ribbon she put on with her chandelier earrings and 33.19-Krupp diamond ring for the Oscars in 1992 was the most important piece she wore for Hollywood’s biggest night. The fire engine red swath of satin represented Elizabeth Taylor’s new role in life as an AIDS activist. The star had been sporting the piece for all her appearances in 1992. 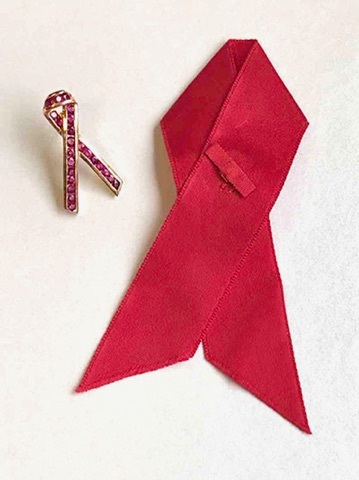 You can find pictures of her wearing the Red Ribbon virtually from the moment it was created as a symbol of AIDS awareness by the Visual AIDS Artists Caucus in 1991. 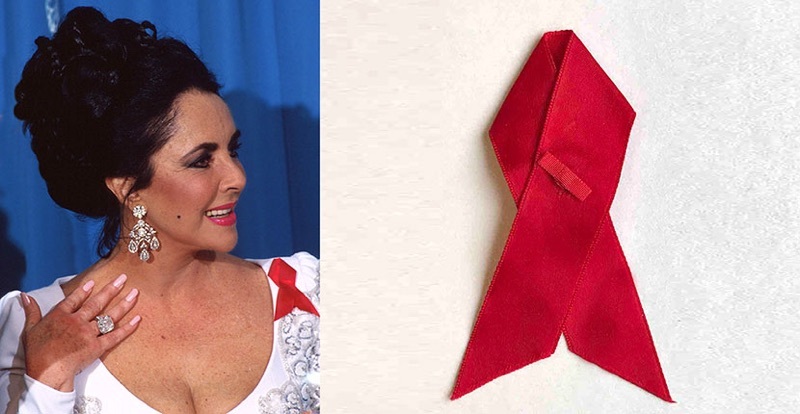 The Red Ribbon was a tangible symbol of the work Elizabeth Taylor had been doing for years. Indeed, Elizabeth Taylor was among the first high profile people to speak out on behalf of the pandemic crisis and raise awareness of the disease. She was driving force that helped turn the perception of AIDS around in the rough years when it was a highly controversial subject. By the time she sported the red ribbon at the Oscars, almost everyone in attendance wore the pins. Watch Ms. Taylor’s entire acceptance speech in the video below and look for some of her red ribbons photographed in this story to appear on the red carpet at the 2017 Oscars on Sunday night in honor of the 25th Anniversary of the first appearance of the ribbons at the event in 1992. 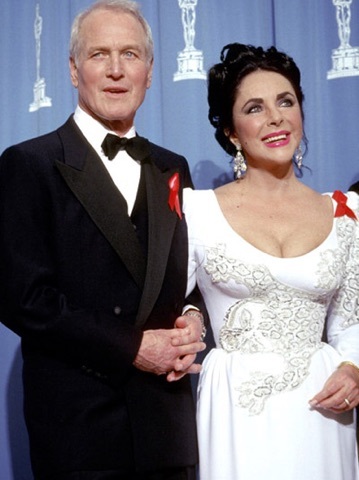 In honor of what would have been Elizabeth Taylor’s 85th birthday on Monday, February 27, make a donation to the Elizabeth Taylor AIDS Foundation by texting LOVE to 27722. Donations up to $100,000 will be matched by Ms. Taylor’s friend, Kathy Ireland.